Although I’ve yet to receive an email from Sony after signing up to be notified, Sony is now taking pre-orders for the Reader Wi-Fi from their website for $149 with free shipping. They have covers for the Reader Wi-Fi too. The regular covers are $34.99 and the lighted covers are $49.99. The covers come in three colors to match each Reader. The Reader Wi-Fi and covers both indicate they will be available on or around October 2nd, a Sunday (nice way to commit on a date, Sony). 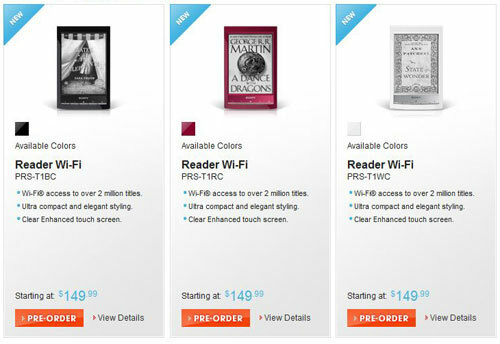 Sony has also put up new Reader Wi-Fi product pages for each color, red, black, and white. These pages have all the specs and product details, but surprisingly there’s really not any new information that we already didn’t know. Unfortunately they don’t have the user manual up for the PRS-T1 series yet—that’s sure to reveal new juicy details. I went ahead and ordered a black unit and a lighted cover, so stay tuned for the upcoming review, and hopefully an Android root tutorial :). I have shunned covers on eReaders in favor of a skin that is made of rubber. I do have cases that I can transport them in, however. My tablet has a cover, but mainly because it also functions as a stand. For me it kind of depends on the device. I found the Kindle 3 to be too thin and the side buttons too close to the edge, thus a cover made a big difference. The Nook Touch already has a rubbery coating and is very comfortable to hold; I’d never think of using a cover with it because that would ruin the whole feel. The back of the older Sony Readers had a tendency to scratch easily without a cover. I don’t know if these plastic ones will be any different, so I thought I’d go with the lighted cover this time just for the heck of it. Yeah the skin I added to my Kindle3 and PRS-350 give it the feel of the Nook Simple Touch. Where did you get those skins? I got the one for the Kindle from Ebay although it probably available from Amazon.com as well. Thanks! I’m going to get the one for the 350, it’s only $2.98. Now I just have to figure out something else to buy to get free shipping :).